HYDE — Six freshmen starters stole the spotlight on Senior Day as the Clearfield Area High School softball team stormed from behind twice, exploding for 10 runs in the sixth inning, to turn back Curwensville 16-8 in a wild non-league game at the Bison Sports Complex Wednesday. Rookies Brooke Cline, Abby Fedder, Erica Hanes, Makayla Ross, Aspen Bishop and Nikki Brossard combined for 11 of the Lady Bison’s 13 hits, nine of the 13 runs batted in and 12 of the season-high runs. They turned on the power, too, with Cline and Hanes smashing home runs and Cline, Fedder and Brossard whacking triples. Junior Sierra Jones also homered for Clearfield, which had just two home runs and three triples prior to the gap-shot binge on BSC’s hard outer gardens. It was a much different story for the Lady Bison at the outset, though, with Lady Tide junior Rylee Young ringing up five strikeouts and not allowing a hit the first time through the lineup. Her teammates had staked her to a 6-0 cushion with five runs in the top of the third inning. Alaina Stiles ripped a two-run single inside third base and Haley McGarry knocked in the last run with a liner over first base. “I said to the girls, ‘It’s not the time to feel self-pity, it’s time to hit, and we need to go after it now,’” Lewis said. After Cline reached base on an error and Fedder slashed a single to right, Hanes triggered the first Lady Bison comeback by blasting a home run to left center that cut the deficit in half. The Lady Bison continued their hit parade in the fourth frame to turn it into a three-inning game. After Bishop led off with a single, Brossard cracked a triple to right and continued home on an errant relay throw. One out later, Cline boomed a triple to deep center and trotted to the plate on Fedder’s single through the middle. “I was very proud the kids didn’t get quit when they got down by so much so early,” Lewis said. “The kids didn’t hang their heads. The Lady Tide weren’t about to roll over, either, and reclaimed the lead in the fifth inning. Hannah Dixon, who collected four of Curwensville’s 12 hits, lined a one-out single over short and scored the go-ahead run on Haley McGarry’s triple down the right field line. Jordan Proud’s two-out single made it 8-6. “It was a good game until the sixth, both ways,” Lady Tide coach Allen Leigey said. “Then, they just tagged us. They hit the gaps. You have to tip your hat to them, because they just out-hit us. Clearfield (7-12) sent 13 batters to the plate and cracked six solid hits, three for extra bases, before Young finally put out the fire with her 11th strikeout. After pinch-hitter Sierra Jones and Cline, who was on base five times and scored four runs, received the free passes, Fedder’s wicked shot to short filled the sacks. Jones beat the throw home on Hanes’ grounder and Victoria Ireland’s high fly fell in short left center to tie it up again. Ross then chased in pinch-runner Myra Kavelak, another freshman, and Hanes with the game-winning hit to left. Later, in rapid-fire order, Jones slammed a three-run homer to left center, Cline hammered a homer to deep left and Fedder slugged a triple to right, her fourth consecutive hit, and scored the final run on an error. The season’s biggest outburst made Raeleigh Redden the winner in relief a day after she threw 143 pitches in a nine-inning loss at Altoona. She struck out six, walked one and surrendered nine hits and four runs after replacing Karlie Lewis in the circle in the second inning. “Karlie’s been having an ailing back and our play was to try to steal a couple innings with her,” coach Lewis said. “It just got to the point her injury was hurting her and I had to make the switch. Both teams are going to the District 9 postseason, the Lady Bison in Class AAA and the Lady Tide (12-7) in Class A. Beating their backyard rivals would have enhanced the Lady Tide’s seed in what figures to be a very big bracket. For Curwensville, Dixon was joined in the multi-hit column by Stiles, McGarry, Round and Megan McCartney with two apiece. One of McCartney’s would have been a home run at any softball field but rolled into a nearby resident’s tree for a BSC ground-rule double. Leigey had a special reason for getting Clearfield back on Curwensville’s schedule for the first time since 2009, seeing his daughter, Macala, in action. The game had been postponed on the original date, April 24. That made it possible for the Lady Tide coach to join his wife, Brenda, in escorting Macala to the third base line during the pre-game ceremony that also recognized Curwensville seniors McCartney, Round, Stiles, Nikki Harker, Morgan Ross, Heather Thorp, Dominique Newkirk and Kamilla McCracken. Macala is the lone Lady Bison senior. “That’s what it was about, cause it was win-win for me,” coach Leigey said. “We had a lot of fun with it, talking smack back and forth. I guess I lost the house. I’ll be sleeping in the garage tonight. Leigey, who also is Curwensville’s athletic director, made it a point to thank Clearfield AD Bob Gearhart for making the series renewal a reality. His counterpart was happy, too. “It was a good win for our program,” coach Lewis said, calling it a very memorable one. “Curwensville’s a good, quality opponent. The Lady Bison will close the regular season at home against Bradford Thursday. Kayley Harnett 2b 3100, Rylee Young p 2100, Alaina Stiles c 4122, Nikki Harner 1b 4000, Megan McCartney lf 4020, Teghan Jacobson pr 0100, Hannah Dixon ss 4240, Haley McGarry 4f 4022, Heather Thorp pr 0100, Morgan Ross dp 4000, Jordan Round 3b 4021, Olivia McGarry pr 0100, Maddi Bumbarger cf (flex) 0000. TOTALS: 33 8 12 5. 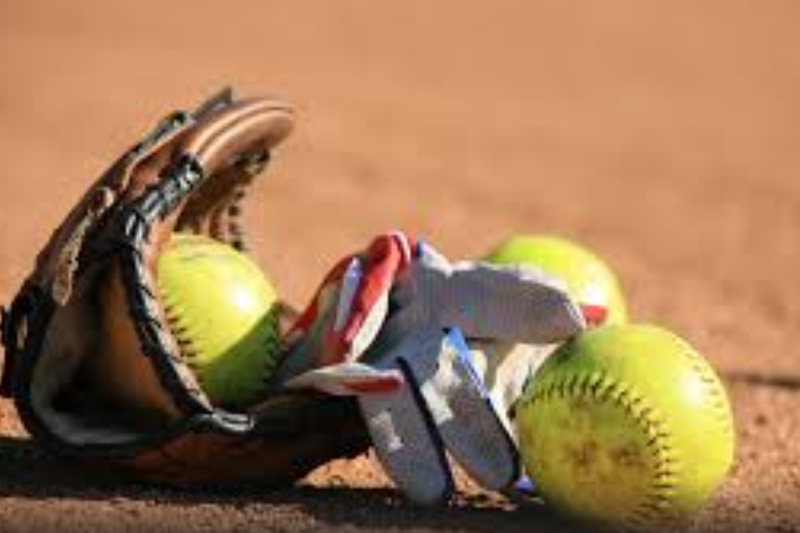 Brooke Cline ss 3421, Abby Fedder 3b 5241, Myra Kavelak pr 0100, Erica Hanes cf 5214, Brittani Priester dp 2000, Victoria Ireland poh-dp 2011, Makayla Ross 1b 4122, Karlie Lewis p 1000, Raeleigh Redden 1100, Aspen Bishop lf 4210, Nikki Brossard c 4111, Macala Leigey rf 2000, Molly Sartin rf 0000, Sierra Jones ph 1213, Lauren Butler 2b (flex) 0000. TOTALS: 34 16 13 13. E – Young, Harker, Dixon, H. McGarry, Round; Fedder 3, Redden. PB – Brossard. LOB – Curwensville 7; Clearfield 5. 2B – McCartney. 3B – H. McGarry, Round; Cline, Fedder, Brossard. HR – Cline (1), Hanes (2), Jones (1). Sac – Redden. SB – Stiles, Dixon; Cline. Curwensville – Young 6 IP, 13 H, 16 R, 14 ER, 4 BB, 11 K.
Clearfield – Lewis 2+ IP (faced 3 batters in 3rd), 3 H, 4 R, 3 ER, 2 BB, 3 K; Redden 5 IP, 9 H, 4 R, 4 ER, 1 BB, 6 K.
WP – Young 1; Redden 2. W – Redden (7-11). L – Young (12-7). Umpires – Scott Viehdorfer (plate) and Norm Bender (bases).